Dental implants are an ideal option for people who have lost a tooth or teeth due to periodontal disease, an injury, or some other reason. A dental implant is like an artificial tooth root that is placed into your jaw to hold a replacement tooth or bridge. Dental implants are an ideal option for people in good general and oral health who have lost a tooth or teeth due to periodontal disease, an injury, or some other reason. Under proper conditions and diligent patient maintenance, implants can last a lifetime. 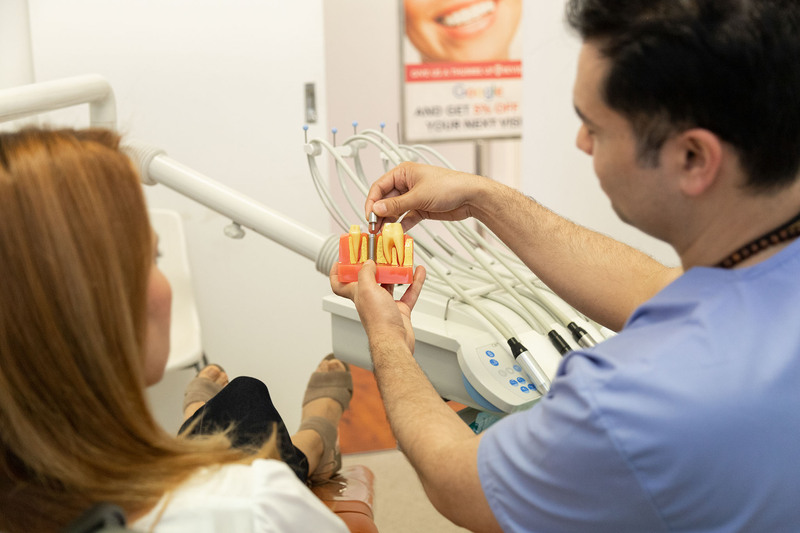 At Normanhurst Dental, we provide tailor-made treatment options where implants can be used to replace a single tooth (with one implant and a crown), multiple teeth (with implant-supported bridges or multiple implants and crowns) or all teeth (with implant-supported bridges or implant-supported dentures). Dental Implants can be categorized based on many different things – by size, by material used, by type of connection on top of the head of the implant and by the stages of the treatment, the last one being the most common. This is the traditional implant process with the first step being a surgery in which we install the implants which are left for three to six months so that they can heal and integrate with the jawbone. Placement in the lower jaw can take upto three months to heal while those in the upper jaw may need about six months. During the healing period, the patient is given a temporary prosthesis until it is time to put in the permanent crown. Placement of the attachment and subsequently permanent crown is accomplished in the second stage of this treatment procedure. Though this treatment-sequence maybe more time-consuming and expensive it still remains the most tried and tested implant treatment protocol in our experience. In the single stage implant, the second stage is altogether avoided and during a single surgery, our implantologists place the implant in the jaw bone in such a way that the top of the implant is higher than the surface of the bone, at the height of the soft tissue(gums). When the soft tissue is stitched at the end of the surgery, the dental implant’s head is left exposed. There is, therefore, no need for a second surgery as the implant is already exposed and takes its place naturally. The advantages of this procedure may include early osseointegration, no long wait for the bone to heal before placing the implant and a more natural and esthetic look early on. The treatment procedure and steps for immediate loaded implants are the same as that for conventional implants, the main difference being that the temporary crown or bridge is loaded onto the implants after its surgical placement. An initial evaluation and x-ray is taken to determine implant site and bone condition. Then the implant site is prepared, the implant is placed and temporary crowns or bridges are cemented. Subsequently, permanent crown or bridge is placed. Immediate loaded implants do not apply to all cases and is dependent on the individual’s bone quality and condition. Following placement of the implants in the jaw, the bone may be sore and the surrounding gums tender and swollen. Patients are, however, able to go about their normal daily activities a day after surgery avoiding any rigorous physical exercises or activities. Benefits of Immediate Loaded Implants include immediately functioning teeth, good esthetic results and shorter treatment time with minimal pain. You’ll find information on Dental Implants in this article on our blog.